Chris Mann’s rise in the music world can be described with two phrases: impressive and well-deserved. 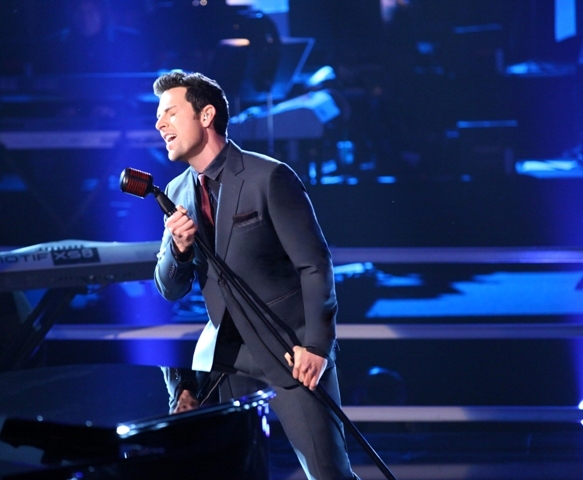 Since wowing audiences on Season 2 of NBC’s The Voice in 2012, the Kansas native has been riding high; he signed a recording deal with Universal Republic, has released three records, had his own PBS special, and is in the middle of a nationwide headlining tour. Yet what shouldn’t be overlooked is that this windfall was very much earned. He might be known as ‘Chris Mann from The Voice‘ to the world, but he’s established himself as a legitimate artist who doesn’t need the reality TV label. His album Roads was one of the best records of 2012. He has range, power, and charisma, and is one of the gentlemen of music. Even with his busy schedule, Chris took some time before his Friday concert at the Grove of Anaheim to chat with BFTV about his plans for the rest of 2013 – and what it’s like to experience this level of success. “It’s obviously really fun,” he said of his current tour. “I’ve gotten to play some really amazing places – Humphrey’s [By The Bay], I’m going to be in Las Vegas this fall – to playing small towns that I’ve never been to, like Mason City, Iowa, which was amazing. Another thing that makes Chris’s tour stand out is that for a select shows, he’s backed by various symphonies. “The tour has some really exciting symphony dates,” he explained. “The next one would be with the Atlanta Symphony coming up very shortly [on October 18]. If you’re coming to a symphony show, you get me being backed by a full symphony, and I do a little different set for those shows. I do a lot of songs people have never heard me do before. On Friday at the Grove of Anaheim, Chris put on a performance that proved he’s not to be missed when he comes to your city. The set list was perfectly constructed, with selections from The Voice, from Roads and from Chris Mann In Concert that somehow managed to sound even better than their recorded versions. The show, however, is far beyond a live reiteration of what you’ve already heard. There are a few songs you won’t be expecting (and we’re not going to tell you what they are) that he knocks out of the park just as much as the more familiar material. It’s an excellent sampling of everything Chris is capable of, across a variety of genres and even in multiple languages. He’ll leave your jaw on the floor once again. Beyond the talent, the show also demonstrates the reason people go to see live music in the first place: for something above the experience we get listening to an artist’s recordings. Not only does Chris sound even better in concert, but he’s a natural showman on stage, sharing various anecdotes from his life, cracking plenty of jokes, and interacting with the crowd throughout the evening. It’s not just listening to great music; it’s also a whole heck of a lot of fun. If you haven’t had the pleasure yet, be sure that you check out upcoming show dates, because you shouldn’t pass up the chance to hear one of the best pure voices in music. Unsurprisingly, the tour is just one of the many irons Chris has in the fire right now. He told us that we can expect “a lot” from him in the near future. “Not only the tour, which goes through February, but my second PBS special starts airing in late November or December for Christmas. I’m really happy about that. Martina McBride’s back on with me again, and Mindi Abair again, doing all my favorite holiday songs. That actually will be accompanied by a new Christmas album and new Christmas DVD. That upcoming Christmas album, Home For Christmas, can already be pre-ordered by clicking here; it releases on October 22. Specific airdates for the new special haven’t been announced yet. If you haven’t seen Chris’s first PBS event, Chris Mann In Concert: A Mann For All Seasons, PBS offers the full show for streaming on its website. It’s slightly mindblowing to consider the totality of what Chris has accomplished since leaving The Voice. He’s unquestionably enjoyed the most success of anyone who’s appeared there, not only outpacing Season 2 winner Jermaine Paul (who still has yet to release his announced post-show album), but having released more music overall and being the first alumni to have a TV special. His career is one that many singers would be dying to have. Yet it’s also ridiculously easy to see why he’s become so successful. Chris exemplifies what The Voice was first about: finding a talented, established artist who deserved more. The show didn’t make him; rather, it allowed the rest of us to finally sit up and take notice of how remarkable he is. He has an outstanding voice, but almost more importantly, he demonstrates a clear dedication to his craft and appreciation for everyone who’s made this next chapter possible. He’s as great a human being as he is a performer. Asked what it’s like to be at this level in his career, “I just feel very lucky,” he reflected. “I’m happy that the music I’m making has allowed me to have really amazing opportunities.” With his combination of vocal ability and class, this should be just the explosive start to a long and prosperous career. Chris Mann’s album Roads is available now; you can get it on iTunes by clicking here. Be sure to visit his official website for upcoming tour dates, and keep up with his latest by following him on Twitter (@iamchrismann).